A baby is a bundle of joy for all mothers and will be loved and cherished by everyone. Nevertheless, with the onset of parenthood, some mothers are prone to go through an ordeal of stress, anxiety and exhaustion that leaves them depressed, with feelings of being let down in life. Known as a depressive disorder, Postpartum Depression is a severe form of mental illness that reflects characteristics such as low energy levels, depressive mood levels and in severe cases, even suicidal tendencies in most mothers following childbirth. Although not true in all cases, many mothers experience either baby blues or its severe counterpart, Postpartum Depression, which ensues a few days after delivering the baby. According to the World Health Organization, nearly ten percent of pregnant women and thirteen percent of women who have just delivered a baby experience a mental disorder in the form of depression, globally. WHO also notes that the rate of women experiencing depression is even higher in developing countries, with statistics indicating a 15% increase in women during pregnancy and a 19.8% increase in women following childbirth. While in most cases first time mothers may experience symptoms of a depressive disorder, it should also be noted that this could have a negative impact on the health of the baby as well, in terms of growth and development. 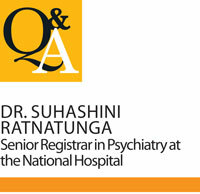 Speaking to Health Capsule, Senior Registrar in Psychiatry at the National Hospital of Sri Lanka, Dr. Suhashini Ratnatunga explained how Postpartum Depression could have an adverse effect on the health of the mother and child, while further elucidating the symptoms, risk factors and treatment options available for the illness. She emphasized that maternal mental disorders such as Postpartum Depression were treatable with proper and timely intervention and that it was crucial to raise ample awareness among mothers on how best to cope with Postpartum Depression. Excerpts of the interview are given below. QCan you define Postpartum Depression? Postpartum Depression is a depressive disorder that takes place during the post-partum period. A depressive disorder is characterized by persistent low mood, low energy levels, anhedonia, poor sleep and appetite. QIs it a condition that affects both sexes, or is it a mental condition that affects only women? Depressive disorders affect both sexes; however post-partum depression is a special kind of depression only women experience following childbirth. QWhat causes Postpartum Depression in an individual? Clinical observation suggests that these disorders are precipitated in vulnerable mothers by the psychological adjustment required after childbirth, as well as by the loss of sleep and hard work involved in caring for the baby. The main risk factors are a previous history of depression and indications of social adversity. QWhat are the symptoms related to Postpartum Depression? Symptoms related to Postpartum Depression may include irritability, anxiety, anhedonia, persistent low mood, poor sleep and lack of appetite. Patients may also experience low energy levels and poor cognitive ability. QHow is this condition diagnosed and how early should it be diagnosed in the patient? The condition is diagnosed by looking for the above mentioned symptoms in all mothers following childbirth. QWhat kind of treatment is administered to patients with Postpartum Depression? Psychological support and pharmacological treatment such as antidepressants, anxiolytics and in severe cases, electro-convulsive therapy are administered to patients suffering from this. QIs it a condition that affects young women who have attained motherhood for the first time or could it occur in any mother regardless of age? It can affect any woman regardless of age, especially if they have risk factors such as depression or indications of social adversity. QHow common is Postpartum Depression in Sri Lanka? There are no figures for Sri Lanka. However, in the context of Sri Lanka, 1/7 of women could be a reasonable estimate for having Postpartum Depression. QWhat are the negative health consequences of living with Postpartum Depression and not getting treatment? Psychological and physical deterioration in the mother with drastic consequences, leading even to suicide is possible if treatment is not taken into serious account. Neglect of the baby leading to improper bonding and physical health consequences are also possibilities. QCould parents suffering from Postpartum Depression have a negative effect on their baby’s well-being? Yes, improper attachment and emotional disturbances such as irritability may occur, and have a negative effect on the baby if the mother is suffering from Postpartum Depression. If detected early, the illness can be treated effectively. Identifying high-risk mothers and monitoring them closely for symptoms is another strategy that we employ. QWhat are the screening opportunities available in Sri Lanka for Postpartum Depression? All mothers attending specialized maternal MOH clinics are given a self-administered questionnaire known as the Edinburgh Postnatal Depression Scale. This has a high specificity and sensitivity when detecting postpartum depression. QOverall, what general advice would you give to those suffering from Postpartum Depression? Seek treatment early, understand it is not a weakness in your personality but due to a biological change in your body. Keep close contact with your doctor and discuss your concerns.